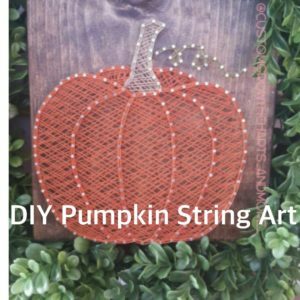 String art is fun! It takes a little patience, but the end result is always a conversation piece! Begin with a piece of 1×8 pine,stained or painted to your liking. Print off an outline of the pumpkin that will fit your board. Next, make dots around the edge of the entire picture,approximately 1/4 ” spacing between each dot-this will become your template for nail placement. Tape the template to the board. Using one nail, tap firmly on each dot to make a hole in the wood, until you’ve gone over the entire template. Remove paper, and begin driving in each nail (18 gauge, 3/4″ wire nail) half way into the board. Once finished nailing, it’s time to string! There is no right or wrong way, just fill it in to your liking! In the picture shown, I numbered the order of color placement to achieve a more realistic look. Have fun and Happy Fall! If you have a miter saw these are super simple. If you don’t- any big box store has a cut station and can do your cuts for you. Sizes can vary- Pick up a package of vinyl polka dots at your local craft store. I picked up a package of gold dots for $3.99 from Target. They also had chevron. I found twigs in my from yard and leftover green tool. Painted the post white, applied the polka dots and then repainted the post orange. Once you paint over the dots- simply remove them for your cute polka dot effect! These were so cute and a 4×4 post was $8 from Lowe’s! You can also go to Home Depot where they sell wood by the foot. This is a cheaper option because you only pay for what you need!